Solidarity with the struggling masses in India, the support of the people’s war and the support of the Communist Party of India (maoist), are important tasks which are given to us by Proletarian Internationalism! 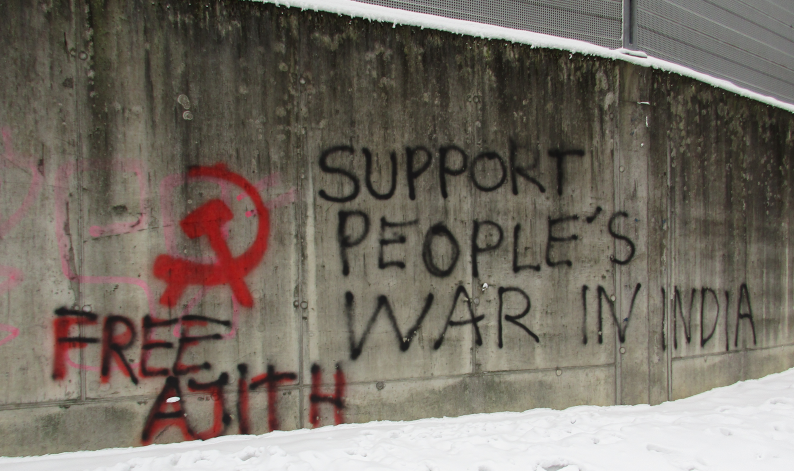 In Austria many activities took place around the 28th of January, the international day of action to support people’s war and free comrade Ajith. These activities were done by the “Revolutionary Construction” and supporters, to propagate people’s war, the important role of the CPI (maoist) and Maoism. 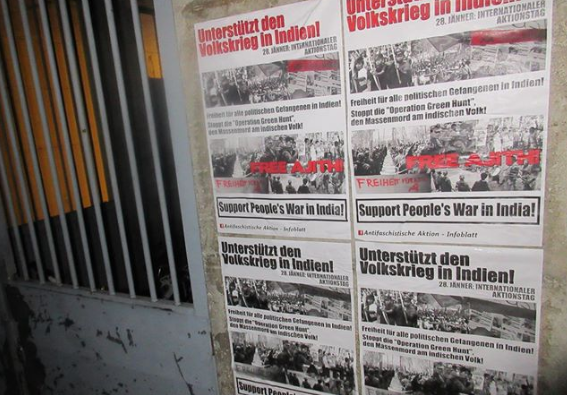 In the past few years many achievements for revolution in Austria could be done with the actions of solidarity with people’s war in India. With agitation, propaganda and ideological debates, but also actions, the basis of supporters and activist was broadening. Activities took place till now in eight (of nine) Austrian federal states. 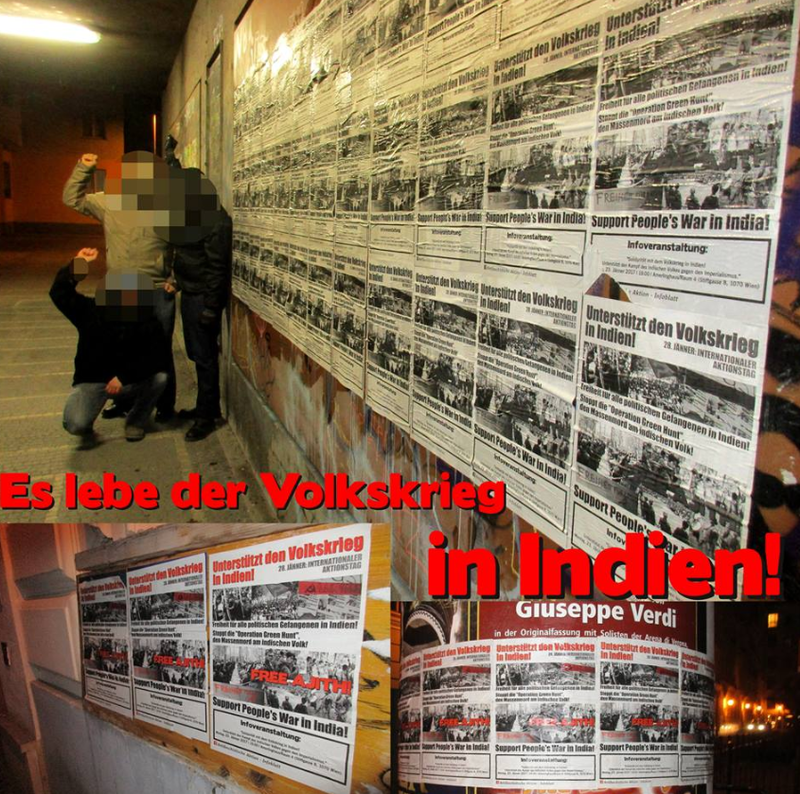 Around the 28th of January in four cities meetings took place, in which was reported about the situation in India, Hindufascism, the development of people’s war, the main role of the CPI (maoist), the imprisoned comrades – with main focus on comrade Ajith. 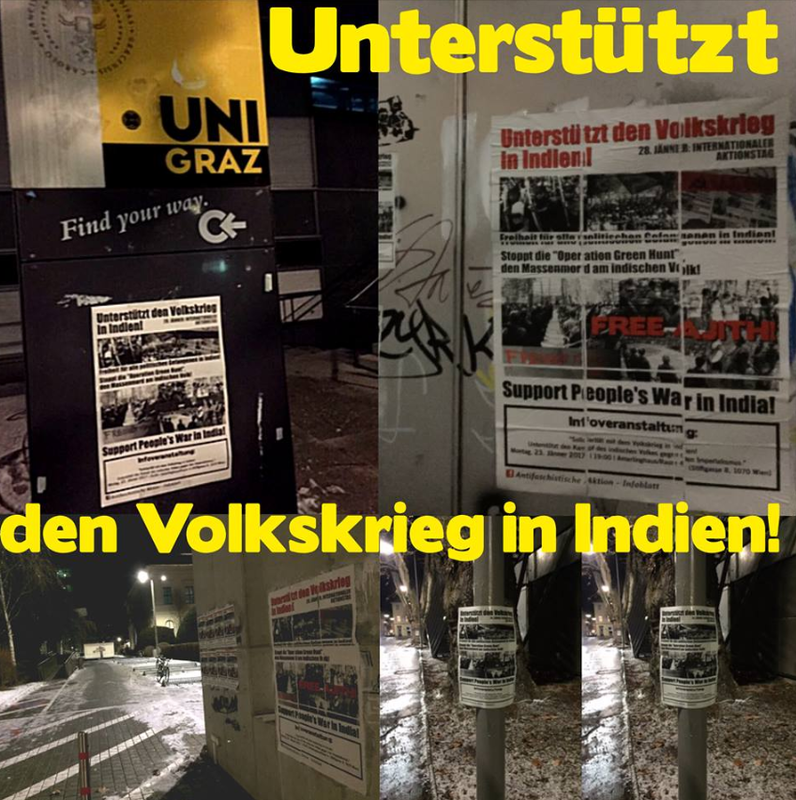 Discussions were made about what we can learn for the situation in Austria and how we do the best support for the struggling comrades in India. There also were action of spreading leaflets, short manifestations took place and posters were spread in five cities. 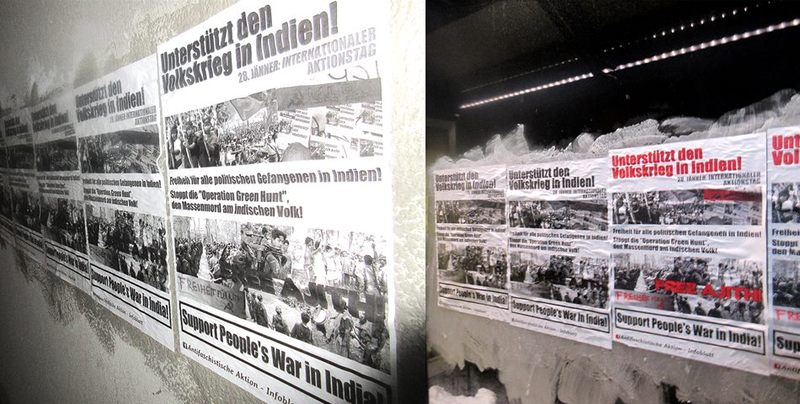 Many pictures of various actions were sent to us! 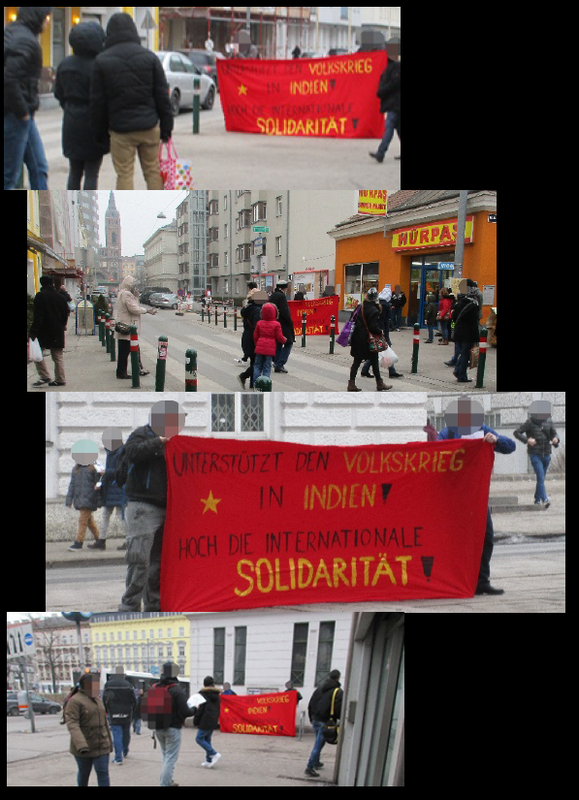 It was an important day of action under the banner of Maoism, which strengthen the revolutionary and communist forces in Austria. The people’s war, lead by the CPI (maoist) is a great example for the revolutionaries and communists in this country to support the task of reconstruction of the Communist Party and the development of people’s war. Forward with People’s War in India! « Jänner Ausgabe der „AfA“ steht nun zum Download bereit!